Skylight Inn, Ayden NC (take two) – Marie, Let's Eat! The second day of our trip was pretty disastrous, with hours and hours spent stuck in traffic trying to navigate around roads closed by the floods in the region. But at least it began wonderfully, with breakfast at one of the best restaurants in the world. Longtime readers may recall my whimsical and silly previous story about Skylight Inn. Whether because that story was so memorable because of how I wrote it or because the restaurant has so much online love and curiosity that people will read anything about the place, regardless of how dopey it is, it’s one of the most shared of all the nearly 1500 posts at our blog. Well, I’m obviously not going to top that story, and I’m not going to try. But I was very glad for Marie to have the chance to try the food that her fool husband was raving about. We left Benson about 8.30 in the morning and made one of the worst decisions we’ve made on our travels. We drove into the part of North Carolina with rising flood waters. The previous afternoon, I phoned both Skylight Inn and Grady’s, which I also had hoped to revisit, and confirmed they would be open. The worst of the flooding, I had understood, was in the city of Greenville, and also around Fayetteville below us, causing I-95 to be shut down. I was not aware that many of the roads between these cities, particularly around Kinston and Goldsboro, were also closed. I got kind of a bad feeling when we crossed a bridge in Snow Hill and saw that the Contentnea Creek was massively swollen. That didn’t look good. We got to the Skylight Inn just before they opened, and got to talk with the fellow running the farm stand next door selling collards. When the Inn’s staff opened up, we sat down to another astonishingly good meal. Just as well it was so good; we wouldn’t eat again for another nine hours. Since my last visit, Sam Jones has taken on an additional venture. 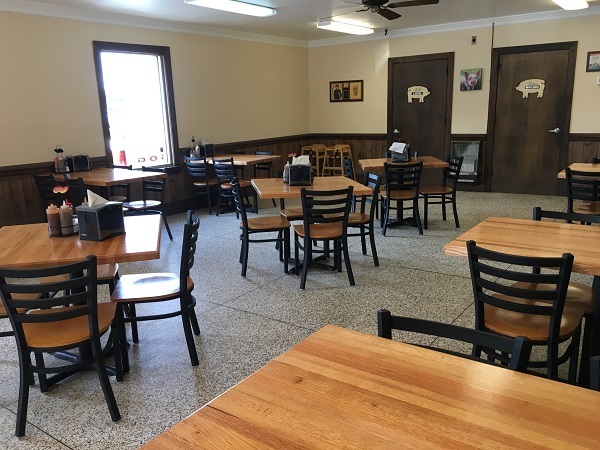 While he still runs the Skylight Inn with its simple menu and dedication to wood-smoked whole hog, he has opened a new restaurant in nearby Winterville. 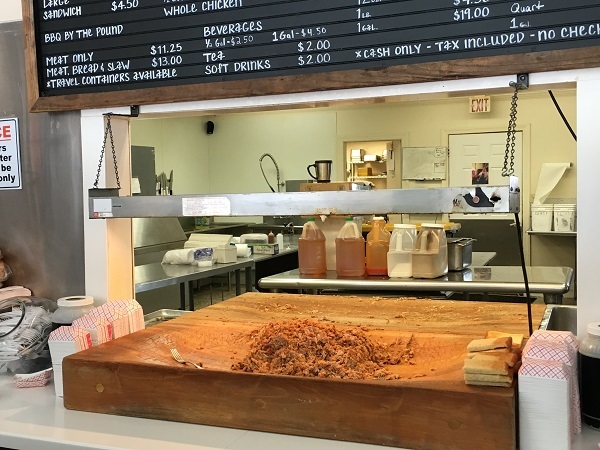 Sam Jones BBQ has a much larger menu, offering wings and catfish and burgers. Writers and hobbyists who can get over here more frequently than I can have been observing a resurgence of wood pits in new, “cheffy” establishments like Buxton Hall in Asheville, Picnic in Durham, and wherever Ed Mitchell is these days. 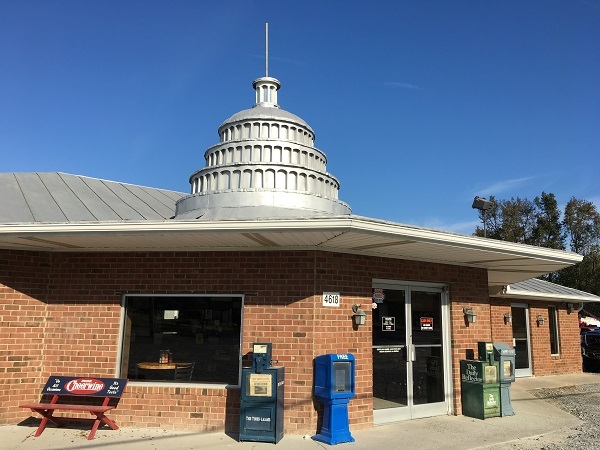 Believe me, I was very, very keen to try these places, but priority one, as mentioned in the last few chapters, was completing the Historic Trail stops, and priority two was bringing Marie to Stamey’s and Skylight Inn. Priority three was giving Grady’s another try. I am certainly the only hobbyist alive who didn’t completely love that place and I really wanted to give them another chance. There just wasn’t time or money to hit the new joints on this trip. And as for my priorities, well, two out of three isn’t bad. Our son was good enough to try Skylight Inn’s barbecue, but he didn’t like it. Tragically, the kid just does not like barbecue, despite Brunswick stew being the first food he had other than milk. But Marie was pleased. She wasn’t wild about the vinegar sauce that you find in eastern North Carolina, but she enjoyed the meat. And I loved it. It was completely heavenly. I wish I could eat here more than once every couple of years. I love this pork. It is so smoky and so moist. I love the flavor, and adore the skin cracklins in the meat. This is great, great barbecue. We thanked the staff for our meal and got on the road, expecting to be at Grady’s in about an hour. Forty minutes later, everything fell apart. We made it to Kinston just fine, got out of the traffic circle and started west. In front of us, the road was blocked; the Neuse River was overflowing. The GPS sent us north again. We noted closings in the system and tried this way and that. National guardsmen gave way to civilian volunteers telling us we couldn’t go any further. All the creeks that fed the Neuse were overflowing. We were in the way of people who had legitimate need to be on the roads. We should not have been there. We were absolutely and totally wrong to have stuck our dumb tourist noses in the middle of an emergency. We gave up, and said screw it, we’ll just head for South Carolina, and Scott’s. The GPS told us we were insane. In Goldsboro, we waved hello to Wilber’s and would have stopped if we weren’t trying to just get out of the way. We failed. We were in the way. We should not have been there. We finally got back to I-95 and, after several minutes making decent time south, were forced into another detour. We joined a mammoth crawl off of I-95 onto I-40, and went north just one exit to US-301. Here, the GPS (we use an app called Waze) did direct us away from the traffic and we made the best time anybody could ask for to Fayetteville. After four hours in the car, the five year-old deserved a break, so we just let him play at McDonald’s. I bought him a Happy Meal and bought a homeless kid two burgers. Time-wise, the choice left to us was to go to Scott’s and get there shortly before they closed, knowing that the restaurant sometimes sells out, or stay on I-95 in South Carolina and drive at top speed and make it to the next two stops on our list. When you’re dealing with full-time jobs, tighter budgets than we’d like, and fall breaks at the school, you don’t always have the flexibility to change your schedule and come another weekend. I am glad of the meal at Skylight Inn, and incredibly happy that Marie could share a favorite place with me, but had I known just how bad things were along the Neuse River, we would absolutely not have gone that way. We should have left Benson at first light and gone straight to South Carolina instead. If there is a next time, I will not be so damn stubborn and foolish. Posted on November 25, 2016 by Grant G.Posted in barbecue, greenville, north carolina, roadfoodTagged ayden, barbecue, barbecue - our favorites, greenville nc, ncbs historic barbecue trail, north carolina, roadfood.com, southern belly. 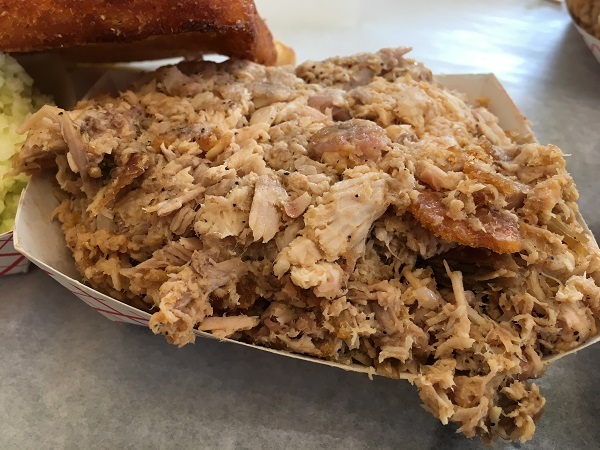 I really enjoy this series of posts about North Carolina barbeque. I have read so much about the Skylight Inn and other famous places like Lexington #1, Parker’s, and Speedy’s. I sure would like to try more of these for myself one day. I can endorse a trip like that! I’d do it again this weekend myself if I could.